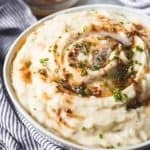 Learn how to make Garlic Browned Butter Mashed Potatoes and skip the gravy! Creamy and oh-so flavorful, this potato side dish is sure to be a hit with any meal! Peel and wash the potatoes, then cut into small 1- to 2-inch chunks. Place the potatoes into into a large pot and fill with enough cold water to cover the potatoes by one inch, then salt with around two teaspoons of salt. Cover the pot and bring to a boil over high heat, then reduce the heat to medium and cook until the potatoes are soft and you can easily insert a fork in them (around 25 minutes). Drain well in a colander. While the potatoes cook, melt the butter in a small pan over medium heat. When the butter begins to bubble and foam, lower the heat to medium-low and stir the butter occasionally, monitoring carefully so that the butter does not burn. Add the minced garlic. The butter will turn a deep caramel color and browned bits will accumulate in the bottom of the pan. Remove from heat. Add about half of the garlic browned butter to the potatoes, along with the cream cheese and mash or beat the potatoes with a potato masher or electric mixer. Taste the potatoes and add salt (1/2 teaspoon at a time, if necessary) and the 1/4 teaspoon pepper to the potatoes and stir. Serve the mashed potatoes either individually plated or family style with the remaining garlic browned butter for drizzling over the top of the potatoes. Garnish with chopped chives, green onions, or parsley, if desired.